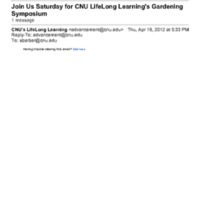 An e-mail with background information about the keynote speaker, Holly Shimizu. 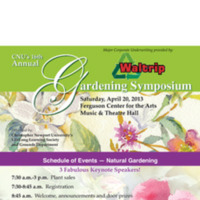 An email advertising the annual Gardening Symposium for April 21, 2012. 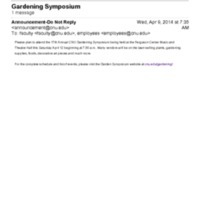 Email announcing that the 17th Annual CNU Gardening Symposium will be on April 12, 2014.